You have one more week to run over to the Museum of Modern Art — this will necessitate a quick trip to Manhattan if you’re not already there — to sit with Marina. That would be performance artist Marina Abramovic, who has been hanging out in the atrium at a bare table in the middle of a huge, white space with itinerant visitors every day since late March. She doesn’t move, she doesn’t speak. You can do the same, seated across the table, for as long as you like, if you’re willing to wait in line. One sitter sat for more than a day, incurring the wrath of the sitters-in-waiting, but a large, soft-spoken guard and the general tradition of gentility at MoMA keep the lid on things. While I was talking to her, Abramović was anything but still. Her habitual anxiety and jovial hyperactivity – so different to the formidable power and placidity she has demonstrated in 40 years of extreme acts of endurance – were in overdrive. “People don’t realise it is pure hell sitting so long,” she said in her thick Serbian accent, while fidgeting. Cramps will set in after an hour or so. Her bum will begin to hurt. But she will ride out the pain. “The concept of failure never enters my mind,” she insists. To insure against it, a masseuse, a nutritionist and a personal trainer will visit her apartment before and after each day’s work. She will undoubtedly need all of the above, and possibly a long soak in a hot tub. Visitors, though, get off easy and certainly are never bored. For the rest of the show, a retrospective of her work including some fifty pieces from four decades, visitors are invited to galleries upstairs. Entrance to those galleries involves squeezing in between naked people standing in the doorway (Abramovic trained others to replicate her original creation of the standing-in-the-doorway piece, when she and her partner were the standers-in), but the squeamish can go through an alternative entryway. 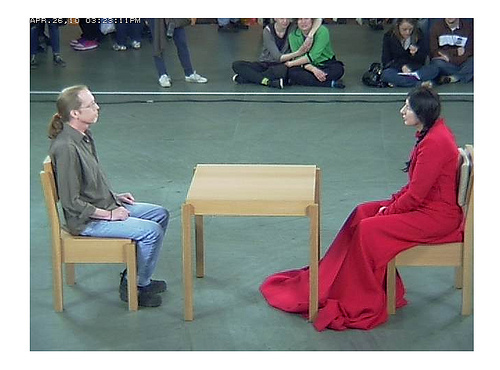 It is the contemplative aspect of the seated Abramovic that most strikes this viewer. Sitting motionless, speechless, for extended periods of time suits some of us better than others. My gentle therapist friend Sue, for example, leaves this weekend for a vision quest. Part of it, she explained, will involve four days in the wilderness, alone. “No books? !,” I said? She gave me one of those patient, indulgent laughs. I think that means you just sit with yourself, possibly speechless, motionless. I’m not so sure about myself, but Marina Abramovic could handle it. Performance artist Marina Abramović – ‘I have to be like a mountain’ | Art and design | guardian.co.uk.